According to The National Center for Health in Public Housing, over 2 million residents live in public housing across the country. Public housing was initially developed to offer safe, decent rental homes for the lowest income households – roughly 36% of public housing households include someone with disabilities; 37% are children, and 16% are seniors. The average yearly household income of this population is $13,984, which is well below the federal poverty line. The consequences of this disinvestment don’t just impact the economic prospects of low-income households, but also their general health and wellbeing. Studies worldwide have clearly shown that substandard housing – whether subsidized or not – can have profound negative effects on health. Take, for instance, the established link between asbestos and mesothelioma. The use of asbestos-containing materials (ACMs) peaked between the 1930s and 1980s, though it was used for centuries before 1930 and still remains in small percentages in materials produced today. Asbestos was once considered a miracle mineral of the early 20th century, renowned for its tensile strength, flame and heat retardant properties, and low cost. It was used pervasively as a way to cut the costs of building and maintaining housing properties. Unfortunately, asbestos is also well-known for being the sole cause of the dangerous cancer mesothelioma, as well as asbestosis and occasionally lung cancer. Despite these terrible health impacts, asbestos was used liberally throughout these years and remains in many buildings to this day. Low-income housing properties are a prime suspect for still having ACMs present because US law doesn’t specifically prohibit the mineral, as long as it is kept in good repair. Elderly people are most at risk for developing mesothelioma and other health ailments, due to their longer exposures to toxins and degrading immune systems. Seniors make up a large percentage of public housing residents, making them a large worry for contracting mesothelioma or other diseases. Other health threats posed by substandard housing include lead poisoning, collapse or general infrastructure failure, mold, and poor air quality. Everyone deserves to live in a home where their health isn’t consistently at risk, but that isn’t always the case. Residents of these properties can ask their landlords to get their buildings checked for toxins and structural issues since landlords have a legal duty to maintaining their properties in livable conditions. However, many landlords are either unable to make these repairs or unwilling. Additionally, a lack of government resources to support these upgrades makes these repairs even more difficult. Investing in the safe renovation of these communities would have a large positive impact on the residents and the community. Housing that is affordable, especially for the most vulnerable low-income households, is badly needed across the country. But we must make the necessary investments to ensure that affordable housing is also safe, decent, and healthy to live in. Research shows that carefully planned and well-maintained affordable housing can have a positive effect on the health outcomes of residents. That’s why housing and health partnerships have formed through the Opportunity Starts at Home campaign to advocate for more robust and equitable federal housing policies. In the campaign’s newly released policy agenda called “Within Reach,” the campaign calls for a substantial expansion of the supply of affordable housing, a substantial expansion of rental assistance, and the creation of a new national program that provides emergency assistance to households during a crisis. Through these powerful new multi-sector partnerships and an ambitious policy agenda, the campaign hopes to elevate housing affordability and its health implications to a national conversation. Health care advocates are housing advocates. We must make adequate investments to ensure that affordable housing is also healthy housing. This blog was written by the Mesothelioma Cancer Alliance for the Opportunity Starts at Home campaign of the National Low Income Housing Coalition. On September 6, 2017, Irma decided not to turn north as predicted but take its path directly atop the Virgin Islands, at a strength the Caribbean had never seen. My home, my island life of the past 18 years shifted from paradise to despair. As we go along this road called life, there are times we find ourselves in unexpected situations, detours without choices, where all we can do is buckle up, hang on and stay the course for the ride. As we speed along our journey to reach destinations of who we think we are and who we hope to become, the fabric of our identity along with everything we had created and all we owned, was gone, erased as if it never existed. The next day the sun does rise as we gather each morning at Mongoose Junction to hear the latest news, who or what has been located, whole, alive or dead, who is still missing, and the prioritizing of the most pressing of needs at the moment. A natural rhythm of how we can be of service to each other forms as we divide ourselves into various teams. There are the announcements from government officials imposing curfews, search and rescue updates and when we can anticipate the arrival of supplies and aid. In the aftermath that follows there is a grace within the necessity of momentum, the activity that survival brings forth, a call to action to participate with your community to create the basics of food, shelter, and unity. You realize that your days in scouting and summer wilderness camp and the wise advise the Rastas taught me about island bush skills were now being put to the test. It is day three and I am overwhelmed with gratitude that I made it to a safe and dry space for the night, walking up steep hills to reach my destination. I have with me a styrofoam container full of food for the night and snacks for the morning and a precious bottle of drinking water. As the sun is setting, and without distraction, without a way to connect to anyone or anything, no movie to watch, no book or emails to read you come to the painful realization that you must reserve what battery power your phone has until you can recharge again. This device that thankfully was spared destruction becomes your everything: clock, flashlight, camera, recorder and a true blessing, your music library. It is in the silence when I begin to recollect what just occurred, questioning all that I am and what could have been done differently and wonder what tomorrow will bring as darkness creeps in with the setting sun. It is day 5 and I must find a new dwelling to keep what is left of my belongings, a place to sleep as the property management company needs to put their employees there so other arrangements must be made. Most of my original hurricane roommates had departed the island, evacuated as they were bound to prescribed medications that would shortly run out and those of us choosing to remain had to scramble to find friends with space for us. Everything and everywhere we went was wet, the outside yards full of whatever had been inside, lots of broken glass and the interiors, floors, and walls covered in foliage and mud, all to be cleared so we could exist. We joked that our new best friends were whoever had a roof and owned generators. Most of us now in the mix had decided whether to evacuate due to health issues or family needs or to stay for the long haul – to be part of the recovery process as we heal and rebuild together. The smallest of blessings and the greatest of victories, never a shortage of hugs and helping hands. Money, especially in the form of banking or ATM was of no use as without electricity, as no one could power their systems. Cash for gasoline and diesel for generators was essential, but food and clothing were available at no charge. Immediately, restaurant owners and those of us in the foodservice and hospitality industry banned together and collectively took inventory and stock of all essential and viable products and transported them to three functioning locations where we had the ability to serve three amazing meals a day keeping the island fed. Clothing stores and retailers allotted their inventory so everyone in need could have a clean and dry t-shirt or other items of clothing to wear. Parents and caregivers created daycare for children to play, eat and be cared for while their parents worked. We pulled together despite ourselves, processing shock, disbelief, and grief. As the death toll rose, ‘survivor’s guilt’ rose too, and the most difficult for me to navigate was ‘hero’s complex,’ fighting for control to prove my value. St. John was starting to receive news of tremendous financial help coming our way from the celebrities who use the island as a way to market their brand and the multimillionaires who own the villas and financial companies residing for corporate and personal income tax avoidance. As lines of communication began to open up, our families and loyal visitors that come as often as possible and call St. John their home away from home were preparing to send us goods and money, though we had no way to access these funds. Puerto Rico and St. Croix were the first to arrive with the National Guard and SWAT, which were coordinating efforts with the Coast Guard, establishing order where necessary, clearing roads, conducting search and rescue and establishing a medical facility and base from our hospital, as St. Thomas’s facility had been destroyed. On Day 7 came FEMA and Red Cross, agencies we were told would give aid in this process, only to find out most were coming to profit from our calamity. We had no idea that an official looking shirt and tags with FEMA translate into a subcontractor or NGO. I am not sure we ever had any real FEMA representatives on the island. On Day 9, signs went up and the rumors started to spread that FEMA had ordered a mandatory evacuation of ‘unnecessary’ residents as another storm approached. They said we would be transported to San Juan or Fajardo to be taken to the airports where we would wait and be airlifted to the USA. Having not lived in the continental United States for 18 years, where would they take me? What if you had nowhere to go? Did they not understand that the worst had already been done to us and that if Maria did affect us, there was nothing else to come down? How were they going to get us all out of Puerto Rico when Maria’s trajectory was rapidly speeding up? There wouldn’t be enough time to evacuate us all. They were going to be placing us in greater harm, yet no one would listen. We later realized that the motions that had been set in place were based on captains who were contracted and paid by FEMA. FEMA wanted us out as it would mean fewer people to feed, telling us they would not be able to keep us with resources so we had to go. The next day, Sunday, September 17, the military and personnel that had been assisting us vanished. With FEMA and Red Cross attempting to reorganize us, giving us new instructions daily and disrupting the life-sustaining food supply, ordering the closure of our established food services and replacing them with MREs. They were sending out people to order those of us without homes or jobs to be at the National Park dock to evacuate, telling us we would only be able to take one bag. I did everything to refuse these orders until the end when a ranger from the Department of Interior carried all 3 of my remaining bags in his vehicle to the boat along with my dog, completely against my will ordering me to depart. I had been labeled an unnecessary resident, how could that be after 16 years of residency? That one act by FEMA was the beginning of a very long journey that took me to remain on Puerto Rico for 7 months, homeless, forgotten by officials, scrambling for safety on an island where I had no association, no friendships, no money and little knowledge of the Spanish language. When the boat they put us on arrived in Puerto Del Rey in Ceiba, we realized that FEMA contractors had betrayed us. We were not in Fajardo or San Juan and all that was waiting after hours of sitting on the boat with the captain not allowing us to disembark, was ICE, DEA and Border Patrol treating us like animals and then literally caging us behind a chainlink fence for a meal that again, a catering crew was hired by FEMA to feed us. We were left at the wrong port, without the facilities or transportation promised to fend for ourselves, and over a hundred people and as many animals not knowing what was next. Those who possessed cash could access their accounts by private taxi, again people making money to transport us charging 5 times the normal rate to take us to the airport. I am a single white female, 58 years of age, left to survive my second hurricane in less than 2 weeks without the safety of my community network, without resources, with 3 suitcases and a dog. Where was I going? I set myself, my dog and my belongings outside the fencing on a grassy spot in the shade and called my son, who coordinated his siblings to send money to get me through. The caterer was kind and hearing my story, contacted their relative who operated an Airbnb and made arrangements for me for the night, driving me to their home. It was a charitable consideration shown to me that night that ultimately got me through what would become and still is the most disruptive year of my life. It was another Airbnb my family found in Cabo Rojo that got me through Maria. I was homeless and moved to 12 different homes for temporary shelter until awarded my Temporary Shelter Assistance (TSA) hotel on December 8. FEMA applications being misconstrued, learning to navigate the process as you learn everyone is denied and must reapply over and over again as the rules kept changing as more disasters around the USA diluted the resources. I was denied food stamps, and then finally awarded $105 a month because I was not legally a resident and in Puerto Rico, and you need a permanent home address to be approved. The stories and circumstances are endless as are the miracles. In the end, Disaster Recovery Center personnel became my hero and Disaster Case Management became public enemy of the people. HUD was there trying to help and then one day they were gone. We never were really informed or educated as to what was truly going on as allotments and rules pertaining to them changed day to day. Puerto Rico did not know what to do with me and all I asked for was to be returned to St. John so I could be part of their system. Why couldn’t someone just pick up a phone and call FEMA there and say, “hey, we have one of yours here and we are going to send her to you?” On Oct 10, they announced that the airports would not be taking people with pets and the ports and supply vessels were for supply transportation only. Now I had no way to leave. I tried hard to get a job so I could financially support myself and stood in line for 3 hours only to be denied a job from FEMA because I am not bilingual, though FEMA was bringing workers from the states without the ability to speak Spanish. My emergency unemployment could not be filed through their labor department, as I could only apply in person on St. Thomas. I could not find employment and without employment did not have a way to secure an apartment. In February I received Rental Assistance from FEMA, however, landlords would not honor it and without steady income again I was denied. Disaster case management representatives are not well trained within the system yet their position is to help us find the resources necessary to rebuild our lives, to fill in the gaps. They would appear at the hotel, go over our progress and never keep their word to implement the plans of which primarily consisted of contacting charities and NGOs. Each time we would be assigned a new Case Worker and have to start all over again. I was eventually denied TSA renewal due to a Case Worker writing a felonious memo stating that he had found me a ticket to travel back to St. John. If only that was true! And no matter what proof the DCR Managers or I provided TSA or FEMA they would not reinstate or give me further assistance leaving me literally homeless and nowhere else to turn. The system failed me as it failed most of us. It’s like a big bowl of spaghetti that no one can seem to find a way to sort out. I was caught up in the chaos determined to return home. I had been displaced and am now living in the USA, still without work, moving from friend to friend, and now at my daughter’s home in Denver. What is the aftermath? What is starting over? Hurricanes come and go, they are storms that momentarily disrupt our lives, destroy material possessions and are largely inconvenient. We are trained to weather the storms but none of us had any training or knowledge of how to weather FEMA and its all-encompassing NGO’s and Contractors. They were the real Hurricane, a never-ending storm that takes you in and spits you out over and over again. It could have been much simpler for us all, temporary housing, food, water, and a few dollars to hit the reset button. The most important element is housing, the foundation for everything else to follow. All the hours I spent moving, walking miles to reach DRC centers and government agencies for help only to be turned away, looking for places to live with my days consumed with survival, an unnecessary struggle with endless promises to be broken and people in offices in faraway places making decisions to place me on a boat and leave me homeless on Puerto Rico, to finally give me a hotel room only to displace me again, to be left to fend for myself. Will someone please explain to me why did they take me down this crazy journey? I lost everything in the storm; my car and my apartment were gone. Losing our personal possessions was devastating, but using this to motivate change is why I’m telling our story. Months before the storm even hit, I sustained multiple injuries in a devastating car accident, forcing me to rely on a walker for mobility. Then I developed a blood clot in my right leg as a complication from those injuries. When Hurricane Harvey hit, disabled, I watched in horror as contaminated storm water surged up through the foundation, bathtubs and toilets and under doors, floors and walls. The water rose higher and higher until our belongings came together as ‘soup’, in a place we had called home for seventeen years. The loss was unbearable as I watched precious home videos of my beloved mother with my only child destroyed; birthday mementos, pictures, valuables, and my treasured antique furniture collection inundated by water. An entire life time washed away in the blink of an eye. To complicate matters, my disabled son, born with multiple autoimmune deficiencies, asthma, and severe allergic reactions to cats and cigarettes was thrust into danger by the rising water and the loss of his safe haven. After 54” of torrential rain, we were trapped inside our apartment; three feet of water outside my front door and parking lot under six feet. My upstairs neighbor, whom I had never exchanged more than a passing ‘hello’ with, heard me beating on our front window to help us escape the flood waters. His heroic effort saved us as he waded chest deep to carry me up to his second floor apartment. We were overwhelmed by his generosity to allow us to sleep on his couch even though he already had several family members and friends, escaping the storm, camped out in his living room. We all huddled together until high water rescue vehicles came several days later to take us to higher ground, but since the shelters could not accommodate our special needs, we stayed a few more days until we could reach my office, a homebuilder’s model home. Since thirty five other employees with our company had suffered the loss of their homes during the storm, the company generously offered us the use of the model homes to live in until we could find suitable FEMA transitional shelter to accommodate our special needs. The storm was over and the recovery had begun but the hardest part of this whole ordeal was trying to explain our special needs to those who did not care or want to comprehend the seriousness of our situation. We found a hotel room, but were quickly forced out after only being allowed to stay one night. The dishonest hotel manager claimed he had overbooked the rooms and needed us to leave immediately. Later, I learned he had charged FEMA and me for the one night. We went back to the model home for another week until FEMA found a new hotel to accommodate our special needs. We faced numerous hurdles living in the hotel room from September 2017 until April 2018. Some of those hurdles took the tenacity of a bulldog, as my family lovingly refers to me. One hurdle was the cost of rent in our old neighborhood skyrocketed. Landlords saw the opportunity to increase rents which forced us out of the area. That same size apartment today rents for $1500, nearly twice as much as our previous rent. Another hurdle was being ripped off by an unscrupulous landlord taking advantage of the crisis after the storm. To rent an apartment that met our special needs, I was forced to purchase special paint and pay a contractor to paint the walls. The contractor exchanged our expensive paint with another toxic paint, exacerbating our asthma, and rendering the apartment uninhabitable for my son and I. FEMA allowed us to return to the hotel but we were still legally liable for a lease on an unlivable apartment. With the help of Lone Star Legal Aid and Fair Housing, we overcame this hurdle and were released from our lease, but our FEMA rental assistance was lost to this dishonest apartment manager. Finally, we found a much smaller apartment in a 55-and-older community but were displaced from our old community and the social connections we had made over the past 17 years. Now we reside in an area that feels unsafe and inconvenient. Furthermore, since rent is adjusted for income, I fear once I start working full-time again, I might be kicked out. With this hanging over our head, we’re afraid to make this our permanent home as we don’t know what the future holds. Even though shelters didn’t want us because of my son’s health issues, and landlords were reluctant to take a chance on us, most of our hurdles were aggravated by FEMA’s slow, archaic practices. Take for instance their Disaster Hotline. We sat on hold for up to 9 hours to receive an answer to questions only to discover it was misinformation; forcing us to travel up to 30 miles to a FEMA satellite center. There we encountered contract workers who didn’t have the necessary tools to process our claims while being forced to use a fax machine to transmit our claims from their centers to FEMA’s main process center, thus, causing massive delays and lost claims. Even though FEMA has an on-line presence, their computerized system doesn’t match their request for information to quickly process your claims as the documents needed to qualify can’t be uploaded. Instead you’re forced back to a community center. As a result of their inefficiency, FEMA kept denying my requests for assistance and my appeals. Once more Lone Star Legal Aid stepped in and was successful in their filing of an appeal to FEMA for more funds to help me get back on my feet. It has been a year since Harvey hit and we are still struggling to overcome this disaster. Although FEMA provided monetary assistance, the funds we received were a mere pittance of what we lost – over $60,000 in damages. And the sentimental value of our losses and the months of misery and uncertainty we endured could not be compensated for by any means. Nevertheless, we are extremely thankful for the generosity of neighbors and friends who supported us during our time of need. Since 2011 the United for Homes (UFH) campaign has been building support for a policy solution that addresses the housing and homelessness crises in America through mortgage interest deduction (MID) reform. Thus far, we have the support of over 2,300 national, state, and local organizations as well as government officials. Moreover, we have the support of thousands of individuals from all over the country, including from all 435 Congressional districts. As we continue to build support from these dedicated advocates of the campaign, we hope to engage with a new source of endorsers: young, college students. As established and emerging leaders, thinkers, and advocates across the country, we believe engaging with college students is an important avenue for growth in the UFH campaign. More than that, we see endorsing the UFH campaign as another channel for educating and empowering leaders in college to take action on issues surrounding housing, homelessness, and poverty both nationally and in their local communities. Younger voices with fresh ideas and perspectives will inevitably strengthen our work as advocates for housing equality. As NLIHC’s field intern and a current student at Georgetown University, I’ve been excited to encourage fellow students to join the UFH campaign. So far, we have the endorsements of several key organizations at my school: the Georgetown University Student Association (GUSA) Executive, College Democrats (pending), GUSA Senate (pending), Black Student Alliance, and Georgetown University Women of Color. We’re in the process of reaching out to other schools and organizations in the DMV area—including George Washington University, American University, Howard University, Catholic University, and the University of Maryland—and plan to start branching out nationally in the coming weeks. If you or someone you know is involved in an organization on a college or university campus across the country that might be interested in endorsing the UFH campaign, please reach out to us at outreach@nlihc.org, outreachintern2@nlihc.org, or jsaucedo@nlihc.org. We’d also encourage folks to check out our recent UFH webinar, Back to School—Campus Activism and the United for Homes Campaign. When I started as the Communications/Graphic Design intern at NLIHC, I had no idea what to expect. Finishing my first year at the University of Arizona, I decided to jump right in and spend my summer getting some real world experience in my field of study. I am currently a Communications and Studio Art student and while I have many years of graphic design experience, I had barely dipped my toes into the world of communications. I am originally from northern Virginia so my search for summer positions started in D.C. When I came across NLIHC I thought, what better way to cultivate these skills than by working towards social justice in the heart of the nation’s capital? The more I researched the organization, the easier it was to see how absolutely dedicated they are to something that was worth fighting for (doesn’t everyone deserve a safe and affordable place to call home?). Needless to say, I was eager for the chance to see the concepts I’d learned in my courses come to life and I am so grateful for the opportunity that NLIHC gave me to do so. I began my nine-week position in the midst of the 2017 Out of Reach launch, their largest annual research report. I was tasked with making various infographics from this research and the statistics I was provided with from the report, quite frankly, shocked me. I had little knowledge of the struggle that average Americans go through just to pay rent, let alone the magnitude of that struggle. It’s a heartbreaking reality for hardworking people all over the country. So while I had initially expected to learn about color swatches and media correspondence, I learned a lot about the crisis that persists in this country as well. 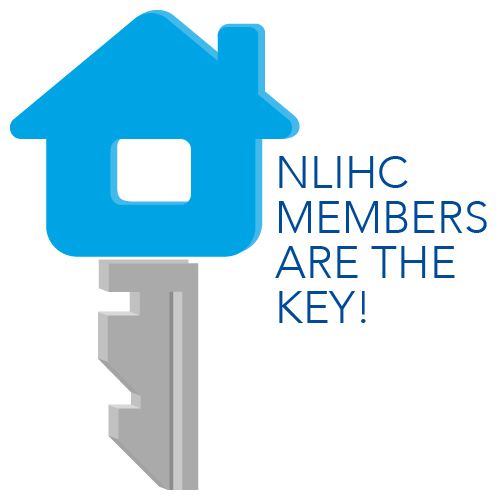 Working at NLIHC has not only provided me with insight into potential career directions but also with a fresh perspective on the immense importance of being socially aware and active. From the very beginning, I absorbed all I could about the nuances of communications and design. I was welcomed by a spirited office full of people passionate about what they do. Every day was something new, from creating promotional posters to updating various websites to scheduling social media posts. It is a dynamic atmosphere and what I’ve enjoyed most is working collaboratively with members of the team, specifically in preparation for the Our Homes, Our Voices campaign promoting the National Housing Week of Action. For this effort, I was able to create promotional posters, rally posters, graphics, and other images to promote the various events, which aided more organizations from across the country to jump on board with the campaign. It was incredibly exciting to see so many different people from so many different places come together (as well as reusing/retweeting my designs to do so!). In sum, I am eager to delve back into my studies with such a valuable experience under my belt. NLIHC has equipped me with so many skills that I fully intend on carrying with me into my future pursuits. Yet as my internship quickly approaches its end, one of the most important things I’ve learned is that when a passion for people is met with a dedication to advocacy, monumental change is not too far behind. Lindsey interned with NLIHC from late June to early August.